As the Canadian heavyweight eight rowing team climbed into their boat—with Dominic Seiterle '98 taking the 6 seat—before the final race in Beijing's Shunyi Park in the 2008 Olympics, their plan was simple: Get out ahead and set a pace so fast that no other crew could stay with them. They were ready. Having conquered the World Championships in Munich in 2007, the crew came to Beijing in August with even faster capability, says Seiterle, "and we had a lot more training under our belt.” Coach Mike Spracklen had trained them not just to be able to win on a good day, when things go right, says Seiterle. “We were trained to the point that if everything were to go wrong, we'd still come out on top." Training is about "going to where you can't go any further, and then going further than that, and then going further," says Dominic Seiterle '98, 2008 Olympic gold medalist. With his Canadian crew, he started the race at 40 strokes per minute. Photo courtesy of Dominic Seiterle. It would prove to be a good day. A very good day. Rowing at a rate well above 40 strokes per minute for the first two minutes, the Canadians quickly gained the lead over the second-place British crew. Coxswain Brian Price shouted out each seat in the British boat as he drew even with it. Seiterle chuckles. “I know Josh, but I have no idea what seat he rows. I'm a numbers guy. So I'm thinking, ‘Where are we? Are we losing? Winning? What?'" “We attacked each call that Brian made,” says Seiterle. “I remember him saying, ‘This hurts but we're moving well!'" The Canadians won the Olympic gold medal with a time of 5 minutes, 23.89 seconds. The British won the silver with a time of 5:25.11, and the American crew took the bronze. The Canadian heavyweight eight in a practice row. "We trained double the load we were doing in 2000," says Seiterle, third from right. Photo courtesy of Dominic Seiterle Early Tests, and the Will to Triumph. At Dartmouth College, where he majored in psychology and environmental sciences, Seiterle competed on the varsity rowing team. In the summer before his senior year, he was diagnosed with thyroid cancer, but even after a thyroidectomy and radiation treatments, he was able to captain the heavyweight crew for the rest of the year. Enormous strength and will have proved to be among the defining characteristics of Seiterle's elite athleticism. After he graduated from Dartmouth, Seiterle competed with the Canadian team in the 2000 Olympics in Sydney, placing 13th in a double with Todd Hallett from Nova Scotia. It would be seven years before he returned to international competition. In Victoria, he got to know one of Todd's neighbors, Laura Miller, a special education teacher, and they began dating. 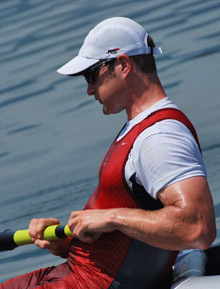 In 2002, he took a year off from rowing to start the MBA program at the University of Rochester. The next year, he rowed 80 miles across Lake Ontario to raise money for the James Wilmot Cancer Center at the university and Ontario's Camp Trillium Childhood Cancer Support Centre. Seiterle was on the Canadian national team pair that was headed to the World Cup in Lucerne, Switzerland, the warm-up for the 2004 Olympic Games in Athens, when he "came down with a fluke blood infection," he says, that kept him on an IV for a month. It took more than half a year to get back in condition. In 2005, he and Laura married, he earned his MBA, and he was back in Victoria, training on his own. Around that time, coach Mike Spracklen was looking to add some horsepower to the Canadian national eight crew. Despite being the favorites in the 2004 Olympics, the Canadian boat, a smaller crew that relied on technique and toughness, fell behind in the final and finished fifth. The heartbreak left team members weeping on the dock. The boat fell short again at the 2006 World Championships, and now Spracklen was looking for answers. One day in February 2007, Spracklen called Seiterle and said he needed a sub. He asked Seiterle which side he preferred to row. Sore in his right shoulder after a fall on the stairs in his apartment building two days earlier, Seiterle opted for the port side. And it stuck. Seiterle hadn't been in a sweep boat for two years, but Spracklen must have liked what he saw. A few weeks later, he asked Seiterle to join the eight. At 6' 4”, 205 pounds, and one of the stronger rowers, Seiterle took the 6 seat, in what's known in rowing as the "engine room" of the boat. Spracklen focused the crew on training long enough and hard enough to be able to win on a bad day. “We doubled the load from what we were doing in 2000,” says Seiterle. The training regimen can best be described, he says, as “going to where you can't go any further, and then going further than that, and then going even further. 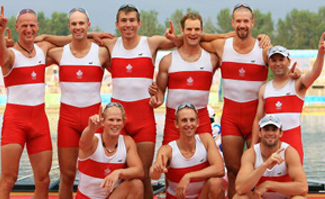 The 2008 Olympic gold medalists in rowing: The Canadian heavyweight eight. Dominic Seiterle '98 is fourth from left. 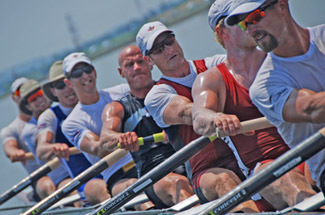 Winning the 2007 World Championships put the Canadian crew up against a jinx: In 35 years, no heavyweight crew had been able to follow up a world championship with Olympic gold—a measure of how fierce the rowing competition is at the international level. At Beijing, they laid that jinx to rest. "It's My 15 Minutes of Fame"
Brooks Clark '78 is a speechwriter for the Tennessee Valley Authority in Knoxville and a former writer-reporter at Sports Illustrated. He rows in a men's eight in Oak Ridge, trying to keep up with his wife, Karen, who recently won a gold and three bronzes at the U.S. Rowing Masters Nationals.